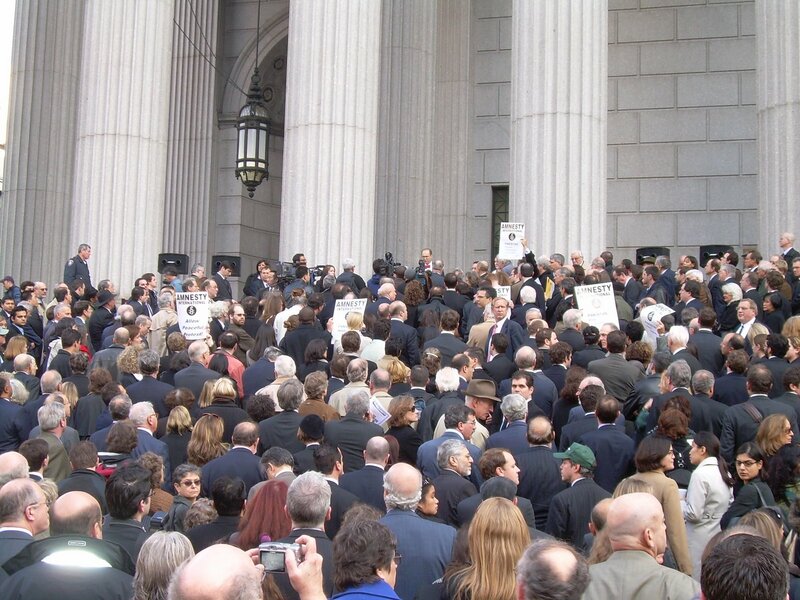 Hundreds of New York attorneys tuned out at 1:00 today to rally in support of Pakistani lawyers that were arrested for demonstrating against the firing of the Pakistani Supreme Court. Some news reports have estimated that 25% of Pakistan’s lawyers are now in prison due to protests against Gen. Pervez Musharraf’s new decrees. I just returned from the rally, held on the steps of the historic New York County Supreme Court building, moments ago, so this is likely a first report on the web. By my eye, the crowd looked to be about 300-400 lawyers, well in excess of what I had anticipated. Attorneys filled the steps of the courthouse and spilled out onto the sidewalk below. The rally had been organized by the New York State, New York County and New York City bar associations, and supported by others. Speakers included a New York Pakistani lawyer whose father has been imprisoned. An email was read from students at Pakistan’s Lahore University about this rally, and they were grateful to see that American lawyers had taken notice and were showing support. click the photo below to read the breaking recap of today’s rally, provided by eric turkewitz of new york personal injury law blog. (photo courtesy of eric turkewitz). ny-rally-pakistan-716586.jpg.